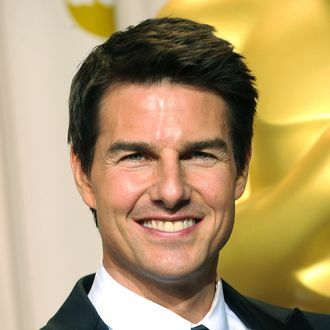 Tom Cruise made about $75 million last year, according to Forbes, which makes him the highest paid actor for 2011–12. (Paging Katie Holmes’s lawyers; Katie Holmes’s lawyers to the money pile, please.) That’s more than twice as much as Kristen Stewart, the highest paid actress in the same time frame, and it also puts Cruise well ahead of the second- and third-place finishers, Leonardo DiCaprio and Adam Sandler, who each raked in $37 million. Dwayne Johnson came in fourth with $36 million (who knew Journey to the Center of the Earth sequels were so lucrative? ), followed by Ben Stiller, Sacha Baron Cohen, Johnny Depp, Will Smith, Mark Wahlberg, Taylor Lautner, and Robert Pattinson. Hilariously, Lautner out-ranked Pattinson on this list thanks to Abduction. Just when you thought that movie wasn’t good for anything!